Our VGreen Project Loans are a great way to reduce your impact on the environment. The Energy Improvement Loan is one of our most flexible options and is designed for a wide spectrum of purchases from home solar systems to bicycles. For larger improvements, our 20 Year Energy Improvement Loan might be your perfect answer. With even longer terms, this option will help you finance big projects, while keeping your monthly payments low. Finally, our ITC Loan is a flexible loan option, designed primarily for solar, that provides an immediate financial benefit from your solar installation. The Energy Improvement Loan offers so much more than a standard loan. With longer terms and discounted rates, this loan offers flexibility in financing a variety of energy saving projects and purchases, including solar and energy efficient heating systems, weatherization and home energy efficiency upgrades, and bicycles. This loan comes with options and levels of discounts and terms, making it easier to tailor to your specific needs and goals. Contact a member service consultant with any questions. Burlington residents: If you are considering buying an electric bicycle, you may be able to save up to $200 by taking advantage of e-bike rebates offered by the Burlington Electric Department (BED). But don’t stop there! We can help you save even more when you finance your bike with our low-interest energy improvement loan. Learn more about e-bike rebates through BED. With long terms and low rates, you can begin offsetting your energy usage with solar and or other renewable energy projects. With terms up to 15 years, the Energy Improvement Loan is perfect for home projects and/or alternative transportation such as bicycles. The Energy Improvement Loan is designed to help you begin impacting your monthly utility bills and transportation expenses immediately. Perfect for a wide range of projects, from solar to efficient appliances and everything in between, this loan is flexible enough to fit your needs. APR = Annual Percentage Rate. APR is effective as of 9/1/2018 and reflects the current minimum APR offered. Estimated monthly payments shown are based on a $10,000 loan. Other rates and terms may be available. The APR may be adjusted based on individual credit standing and term. Calculated payments shown are for estimation purposes only. Actual loan payment amount will be disclosed at loan closing and may differ slightly. Designed to finance larger solar purchases, high-efficiency home heating solutions and comprehensive home energy improvements, the unsecured 20-Year Energy Improvement Loan has discounted fixed rates and an extended term. You’ll benefit from an investment that reduces your home’s operating expenses and provides consistent monthly loan payments. Discounted, fixed rates make this loan an extremely predictable option, perfect for those looking for consistent payments. A 240 month (20 year) loan with a straight amortization gives you manageable, predictable payments to help plan for the future. Save on financing costs by taking advantage of a one-time modification to adjust the pay-down, allowing you to adjust payments and interest. APR = Annual Percentage Rage. APR is effective as of 9/1/2018 and reflects the current minimum APR offered. The APR may be adjusted based on individual credit standing and term. Minimum loan amount is $10,000. Actual loan payment amount will be disclosed at loan closing and may differ slightly. 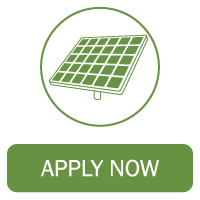 The VGreen Investment Tax Credit (ITC) Loan is a great option for individuals looking to finance a solar or home energy storage project or purchase. This loan is only available for residential properties, and projects qualified for the Federal Investment Tax Credit. VSECU does not provide tax advice. Any taxpayer considering the purchase of an energy storage system should consult their accountant or other tax professional before claiming a tax credit. You can make your tax credit work for you in more ways than one. After the first 15 months, you may apply your tax credit to the principal of your VGreen ITC Loan, or you may use that to pay down higher interest debt and let your loan payments re-amortize to a higher monthly payment but with the same fixed rate. Designed to finance solar and home energy storage purchases that qualify for tax credits and other incentives. You will enjoy 15 months of low payments, after which your payment will increase unless you take advantage of the modification option for this loan. Apply tax credits (or any amount) to the loan principal or use it to pay off other debt and allow the loan to re-amortize at a higher payment. We are all about helping you save money, so we reduced upfront payments to help you start benefiting from your new project as soon as possible. APR = Annual Percentage Rate. APR is effective as of 9/1/2018 and reflects the current minimum APR offered. Minimum loan amount is $5,000. Payment amount subject to change after initial 15-months based on tax credits or other credits applied to principal or re-amortization of the outstanding balance. As an example, a $20,000 loan with a 144 month term at 5.65% APR would result in 15 initial monthly payments of $143.58. If the entire 30% tax credit is applied to the principal during the first 15 months, the monthly payment would remain at $143.58 for the remaining term of the loan. If the principal is not paid down by 30% by month 15, the outstanding loan balance at the end of the 15-month period will re-amortize to $199.33 per month for the remaining 129 months. Other rates and terms may be available. The APR may be adjusted based on individual credit standing and term. Example payments are for estimation purposes only. Actual loan payment amount will be disclosed at loan closing and may differ slightly. Apply: You can apply for most of our loan products online. Our online loan application offers quick results, sometimes letting qualified applicants know of approval instantly. Contact a Member Service Consultant with any questions. Thinking about financing a clean energy project with VSECU? Watch this video for step by step guidance.